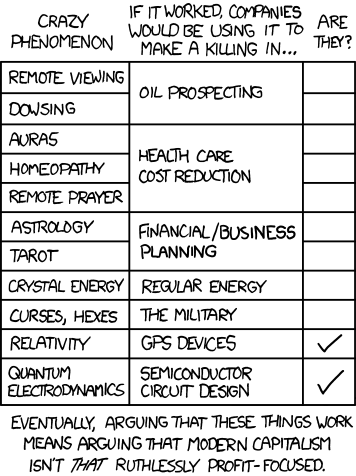 Today’s xkcd comic is a classic but sadly is a bit weak on economic science. While I would like to think that economics could expose supernatural myths, the underlying logic in this cartoon is flawed. The logic is that if X is possible, then Y would be very profitable. The problem is that X is either (i) a skill held by a few individuals or (ii) widely accessible knowledge. If (i), then the people holding the skill would earn all of the rents. You would see the economic profits in their wages and not in the profits of those who employ them. You might argue that we don’t see high pay to dowsers etc. I have to, of course, remind you that you have to take the individual fixed effect into account and demonstrate that someone who purports to be a dowser would be earning about the same wage in another activity. Given that they are likely morons, you can draw your own conclusion on the super-normal wages they might be earning; it is possibly surprisingly high. If (ii), many firms will have access to the knowledge and so no firm using the knowledge would be making a “killing.” Indeed, for relativity and quantum physics that is exactly the case. (ii) The point is not that all companies would be doing better. The point is that any one company that did use it would be doing better than all the others, so they would all end up using it. (i) Your premise that “they are likely morons” is based on the fact that they’re using a technique like dowsing. But that’s begging the question, because if dowsing *works* (the question we’re testing), then they’re not morons. Even is dowsing worked they might still be morons – just lucky morons. But if they’re systematically lucky (an oxymoron) the rents would be very large. Whether those rents go mainly to the company or to the lucky moron is irrelevant to this particular question because if any of the rent at all is appropriated at any stage by any company we would see dowsers used in oil prospecting. We don’t, which suggests such lucky morons don’t exist. xkcd is right. At the very least, if dowsing works then we should see companies using dowsing to make an accounting profit, even if they aren’t making economic rents. The usual mystical explanation for the economic failure of these techniques is that the ‘spirit world’ does not like you using them for a profit. Impossible to disprove but ridiculous nonetheless. Homeopathy in the one item on ‘non-economic’ part of the list that can be conclusively disproven on those grounds as the theory that underpins it does not have a supernatural basis. The phrase “a killing” might be wrong, but consider the example of oil companies using dowsing. Currently exploration costs are enormous – a friend works for a company which found a way to shave a few percent off these costs and they are being paid very well to do it for some of the largest companies in the world. If dowsers could shave even more off surely the oil companies would pay them even more for that – at least one company would have to see it worth the initial cost of being laughed at. As for the spirit world not liking them being used for profit – it never seems to bother the tarot readers, professional astrologers etc, etc. My grandfather used to drill for water in Ireland to connect houses. If you drill in Ireland, you will always hit water, but it used to be quite expensive so the shorter the distance you drilled the more profitable it would be. He would use dowsing to find the right spot to drill. My father was adamant this was his skill, although I suspect there was an element of showmanship. It puts you in mind of Tim Minchin’s line that scientists have a technical term for alternative medicine that works – “medicine”. How do we know that financial planners and investment gurus aren’t using astrology and tarot cards?